Milburn Stone was born in 1904 in central Kansas, fittingly not far from Dodge City. He left home as a teenager to find work in traveling repertory troupes. Appearing in the Vaudeville circuit and on Broadway, he landed in Hollywood by the mid-1930s. For two decades, he played everything from bit parts to leads in “B” movies such as Federal Bullets (1937) and serials such as Tailspin Tommy. In 1955, Stone was cast as Doc Adams in the TV version of Gunsmoke, which had been a successful radio series since 1952. The show would finally give Stone a steady job – and then some. 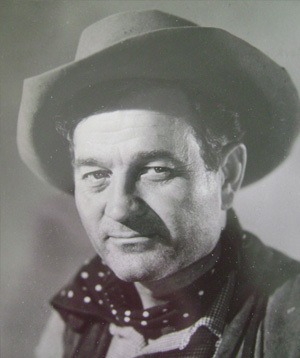 The crusty but sympathetic Doc Adams hung out his shingle in Gunsmoke’s Dodge City for 20 years. Between presiding over births and treating the requisite gunshot wounds, he could often be found counseling Marshal Dillon, bemusing Miss Kitty or needling regulars like Chester and Festus over beers at The Longbranch Saloon. Doc Adams was a character who seems unimaginable now without Milburn Stone to embody him. Stone’s portrayal earned him an Emmy in 1968. When Gunsmoke left the air in 1975 after its record 20 year run, Milburn Stone retired with it. In 1980 he passed away in La Jolla. In 1981, The National Cowboy and Western Heritage Museum in Oklahoma City named Stone to its Western Performers Hall of Fame. His legacy lives on, not only in countless Gunsmoke reruns but in the Milburn Stone Theatre at Cecil College in Maryland. And by the way, Stone received an honorary doctorate from Plains College in – where else? – Dodge City, Kansas.